Nicholas was prepared for something odd, but not for something quite so odd as the sight he encountered. At the upper end of the room [the back parlour at an inn twelve miles from Portsmouth] , were a couple of boys, one of them very tall and the other very short, both dressed as sailors — or at least as theatrical sailors, with belts, buckles, pigtails, and pistols complete — fighting what is called in play-bills a terrific combat, with two of those short broad-swords with basket hilts which are commonly used at our minor theatres [i. e., theatres, in London principally, that did not play legitimate drama, and were not subject to regulation by the Lord Chamberlain's Office]. The short boy had gained a great advantage over the tall boy, who was reduced to mortal strait, and both were overlooked by a large heavy man, perched against the corner of a table, who emphatically adjured them to strike a little more fire out of the swords, and they couldn't fail to bring the house down, on the very first night. Mr. Vincent Crummles received Nicholas with an inclination of the head, something between the courtesy of a Roman emperor and the nod of a pot companion; and bade the landlord shut the door and begone. . . . 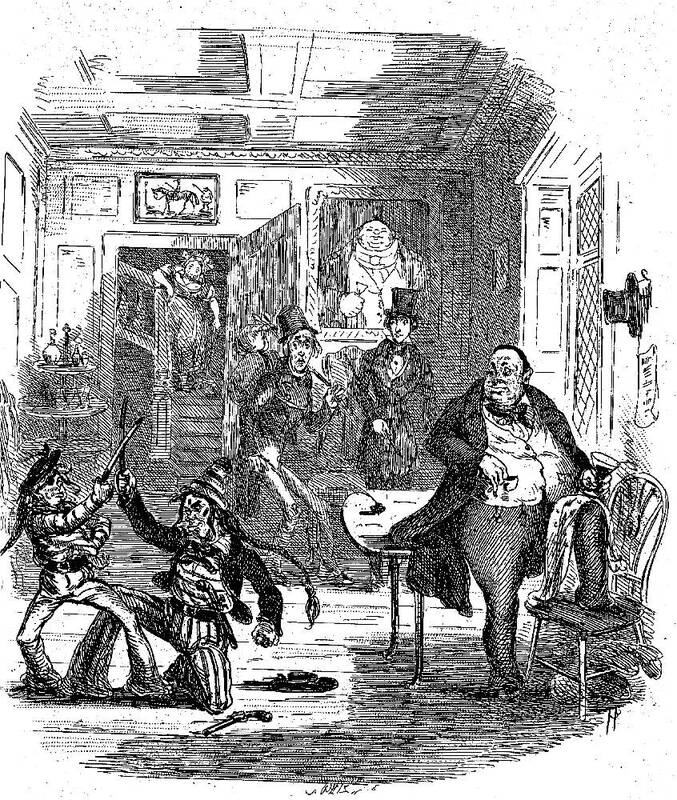 In Phiz's October 1838 steel engraving Smike is notably startled by the violence of the cutlass duel by the mismatched "sailors," whereas Nicholas in respectable beaver and frockcoat (rear, centre right) is only moderately interested for he perceives, as his companion does not, that this is merely theatre and not reality. Just as Nicholas and Smike had intended to do, after Portsmouth the "strolling" Crummleses took ship for America, where Jean was presented to audiences as "an infant phenomenon." Later on the London stage she starred as Dot in an adaptation of Dickens's third Christmas Book, The Cricket on the Hearth (opening 21 December 1846) in Colchester and again at The Royal Theatre, Lynn (opening 27 February 1847) under her father's management and direction. Bolton, H. Philip. Dickens Dramatized. Boston: G. K. Hall., 1987. Davis, Paul. Charles Dickens A to Z. New York: Facts On File, 1998. Hammerton, J. A. The Dickens Picture-Book. London: Educational Book Co., .